Sarah and I are really trying to be health conscious. We are resisting the lure of…well, lots of things. We are embracing lentils! We are eating things raw! We are taking walks with a toddler who loves to watch birds and teenagers playing basketball—and anything else that starts with the letter b.
I mean, really, we are willing to do anything as long as there is some kind of cheese involved somewhere. Don’t be fooled. This salad is delicious (and, P.S., the leftovers were even better than the first serving)! You will be glad you tried it. Besides, lettuce isn’t even in season yet. So it’s still totally fair to make salads mainly from dry goods, right? Right. This lunch required several steps (hey, it wouldn’t be a food blogger lunch if it didn’t, right? ), but all of them were totally simple, and we both spent a lot of time chasing Jake around and ignoring the pots on the stove. This salad is totally doable. First, we must cook the lentils. This is easy: add lentils, garlic, sage, and olive oil to a pot with water and simmer over low heat until the lentils are swollen and not firm in the center. Taste a few to be sure they are the right consistency: slightly toothsome, not mushy, but also not crunchy or hard. Speaking of which, whisk together the lemony tahini dressing. And don’t forget to drain and rinse your chickpeas. 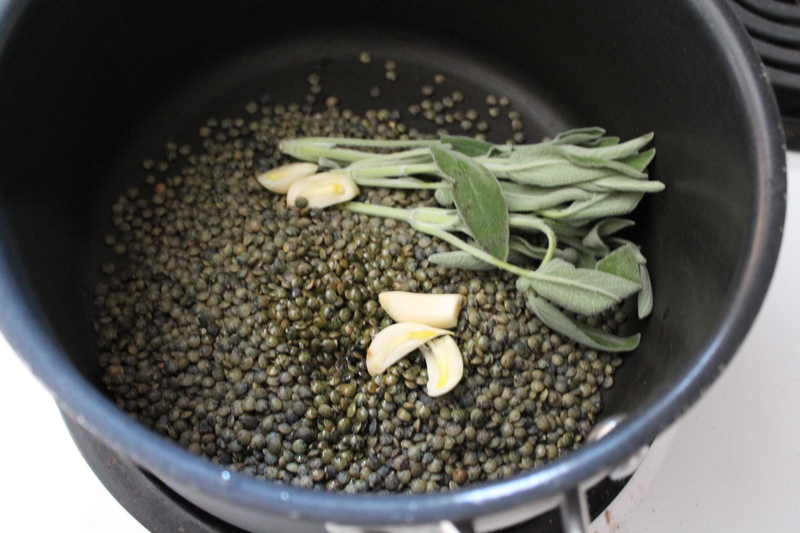 When the lentils are ready, remove the garlic and sage. 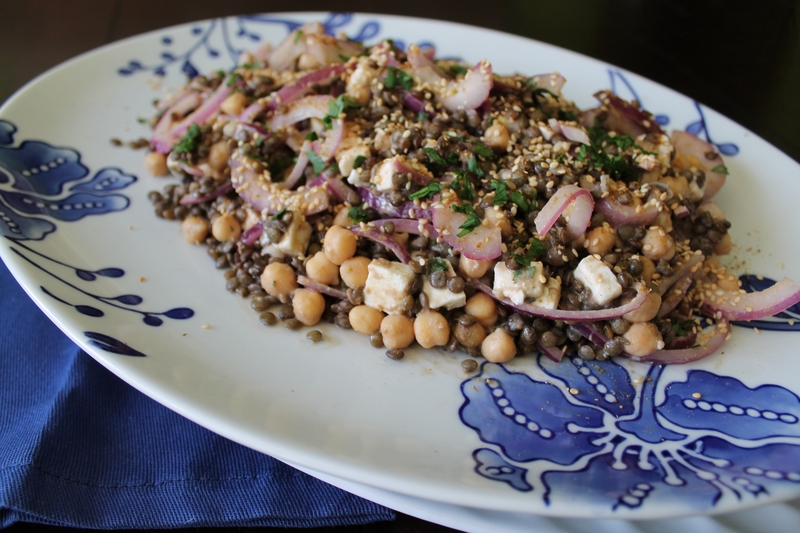 Stir the lentils, chickpeas, lemon zest, and dressing in with the onions. Sprinkle the top of the salad with extra spices and toasted sesame seeds. Garnish with extra fresh cilantro. 2 cups water, plus 2 tbsp. Combine the lentils, 2 cloves garlic halved lengthwise, sage, 2 tbsp. olive oil in a small pot with 2 cups water. Set it over medium heat. Let the water come to a simmer, then turn the heat to low and cook the lentils in a very gentle simmer just until they are tender. This should take from 25–minutes. Take the pan off the heat and let the lentils cool 2–3 minutes before draining them. Pick out and discard the sage and garlic. Meanwhile, make the salad dressing. Combine the coriander and cumin in a small pan and toast over medium heat, about 3 minutes, until very fragrant. Transfer to a small bowl. Mash the remaining clove of garlic with 1 tsp. sea salt until it forms a fine paste. Combine the garlic, 1 tsp. of the toasted spices, 3 tbsp. lemon juice, tahini, and the remaining 2 tbsp. water. Mix well. Taste and add extra salt or lemon if needed. Place onion slices in a medium bowl and break them up with your fingers. 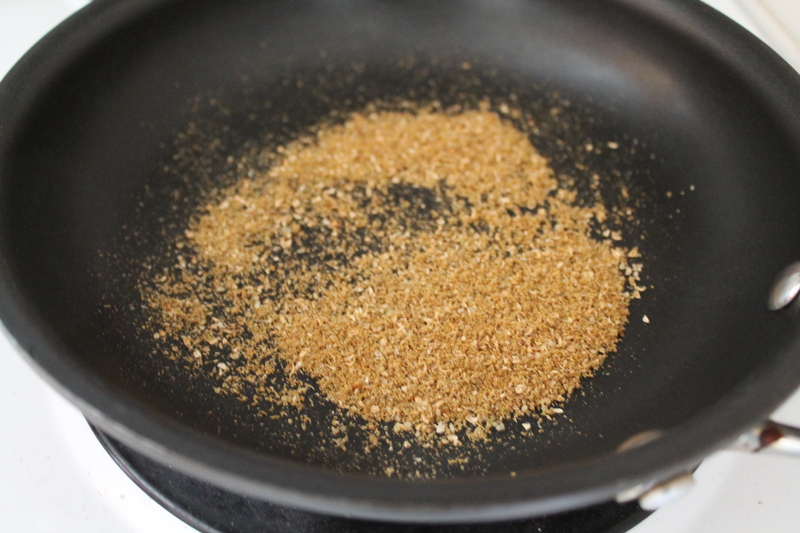 Sprinkle in two good pinches of salt, the remaining 1 tbsp. lemon juice and 2 tsp. olive oil, and the cilantro or parsley. Toss well, then crumble in the cheese and gently toss again. 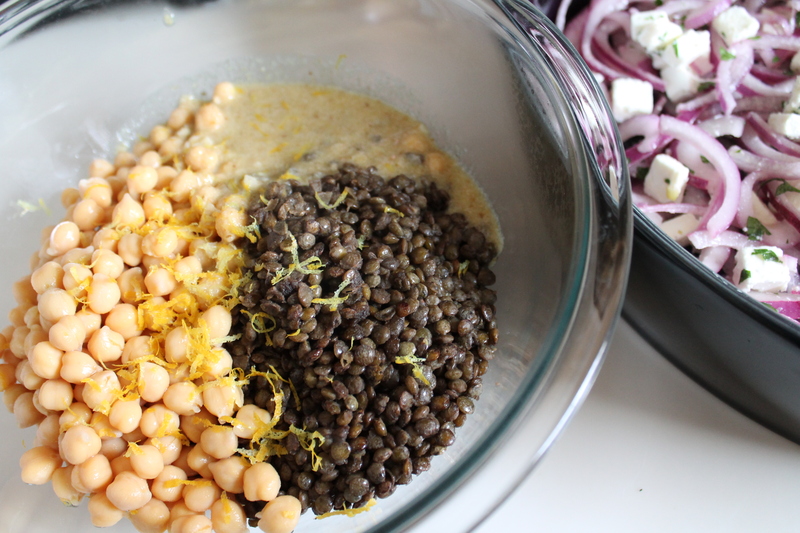 Combine the lentils with the drained chickpeas, lemon zest, and 1 tsp. sea salt in a large mixing bowl. 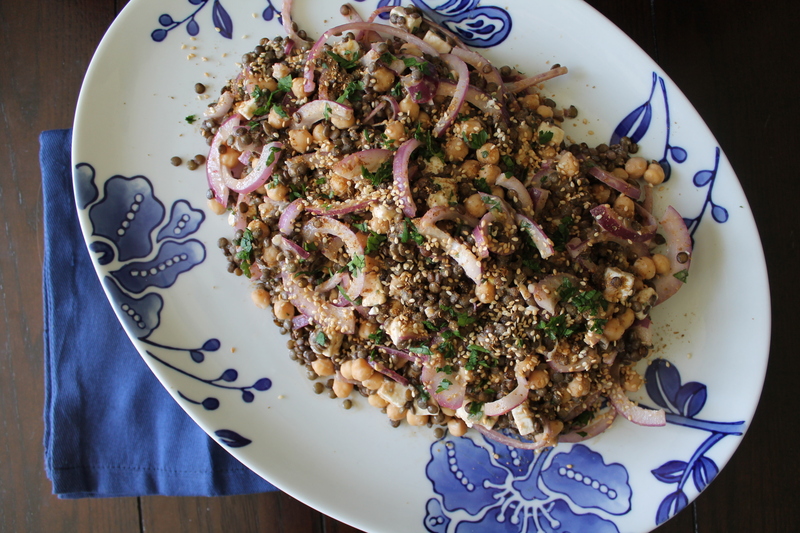 Pour in the tahini dressing and toss well. Toss the lentil mixture with the onions. Transfer to a platter or serving bowl. 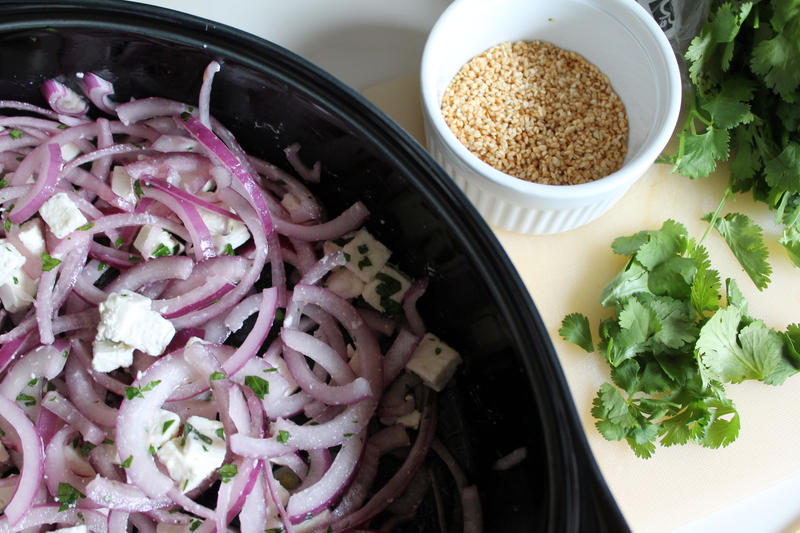 Sprinkle with the remaining toasted spices, sesame seeds, and extra chopped herbs. *Note: Whole spices may be substituted. Use 1 tsp. whole cumin seed and 2 tsp. whole coriander. Toast on the stove before grinding. Oh my gosh, I love that onion photo! Writing my post now 🙂 The feta I like is Mt Vikos Traditional sheep and goat, for anyone who is curious, I get it at Whole Foods.